There is nothing more comforting in the winter than getting out of bed and walking barefoot on a floor that radiates heat. Forget wearing socks and laying area rugs or carpeting throughout the house to stay comfortable. Underfloor heating is a simple luxury that also has the benefit of energy-efficiency when done correctly. The distribution of heat under the floor is a way of increasing indoor comfort without running a forced-air system. It is a wonderful solution to the problem of losing comfort as heat rises and does not provide warmth to the lower portion of the home. It works to effectively remove the frigid chill from the lower part of the room where we feel the most discomfort. Electrical wires or hot-water tubes beneath the flooring radiate heat to warm the surface. 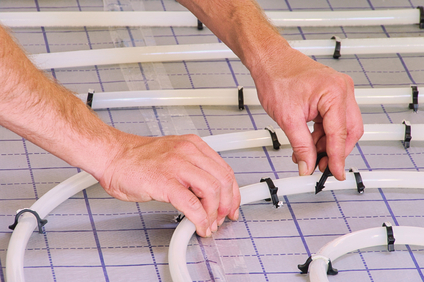 The water system uses flexible tubing to circulate steady warmth from the hot water heater or a boiler. Electric radiant wires are more suitable for single rooms due to the cost of constant energy consumption. Each method generates heat underneath the flooring material so that it stays heated. Which flooring materials work best with radiant heat? For starters, an insulated floor is not suitable for this type of heating because it is not going to conduct properly. Flooring types that work well can withstand high temperatures and have thermal conducting properties. Ceramic tile, stone, and concrete are the best materials for transferring and holding heat as intended. Wood flooring, vinyl, plastic laminate, and carpet are all types that have significant disadvantages and should not be used. 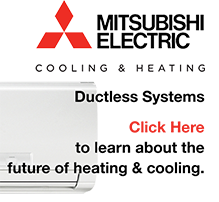 Consider how happy you are currently with the heating in your home, and if you think there is a need for improvement. If you’re already due for an upgrade and do not mind undergoing a new project, it is a great addition to consider. The best time to consider radiant floor heating installation is during the construction phase of building a new home, or if you are planning to add another room onto the home you currently own. You can find out about all of our expert services by calling 856-430-8452, and do not forget to fill out our contact form to get in touch with one of our skilled technicians. We can help you with radiant floor heating installation, as well as provide other solutions for comfort inside the home.